The Satanic Temple (TST) has been busy forming After School Satan clubs in elementary schools across the nation. According to The Daily Caller, a variety of states are being targeted this fall, including Florida, Utah, Massachusetts, Louisiana, Arizona and Minnesota. The TST is seeking to establish these clubs in schools as a direct alternative to already active Christian-oriented Good News Clubs, which were established by the Child Evangelism Fellowship — an organization that’s been around since 1937, according to the New York Times. In 2001, in Good News Clubs Vs. Milford, the Supreme Court ruled 6 – 3 in favor of allowing Good News Clubs to be allowed on public school campuses. The court said that “public schools must open their doors to after-school religious activities.” The Satanic Temple claims that satanic after school clubs should also be authorized under the same Constitutional ruling. Will this new initiative soon be a part of the common core curriculum? Simultaneously, while utilizing a court ruling about clubs representing “religious activities,” the creators of these Satanic clubs, according to the Salt Lake Tribune, reject the idea of any religious worship, or even the existence of any “supernatural being” called “Satan, Lucifer or Beelzebub.” Doug Mesner, also known as Lucien Graves, is a co-founder of the Satanic Temple. He says Satan is merely a “metaphorical construct,” not an otherworldly ex-archangel who fell like lightning from the third heaven and has ruled the airwaves to this day. What Mr. Mesner wants is for elementary school children to not be indoctrinated with a heaven or hell scenario, and to instead give these young children the opportunity to “reject all forms of tyranny over the human mind.” Seems heady stuff for a six year old. To attend, children must have a parent sign a permission slip, just like any other school extra-curricular activities. The slip suggests that children signing up for the club should be curious, and claims that while your child spends time with the group after school, he or she will engage in learning to freely express ideas, participate in rational discourse, problem solving and character building. This sounds a little like what parents and grandparents are supposed to teach. After School Satan clubs will also focus on rational thought and critical thinking skills. What happened to After School Socrates? There’s nary a mention of Anton LeVay, who was the founder of the Church of Satan in the U.S. And After School Satan currently doesn’t discuss the existence of demonic entities, using pentagrams or the social implications of drinking blood. Maybe that’s the high school version. The FAQ section of After School Satan says that those pesky evangelical Good News Clubs “robs the innocence and enjoyment of childhood.” And The Satanic Temple does make a clarion call to stop corporal punishment in schools. Is this genuine concern, or mere window dressing to garner recruitment from the broken and disenfranchised? You can tell a lot about a campaign when you look at its marketing strategy. After School Satan’s promotional video seems more like a horror film and less like an invitation for developing minds to explore art, creativity, free thought and a sweet afternoon non-GMO fruit snack. Spend time reading and speaking with your young children today. Go for a walk in the park. Nurture them with superfoods so they can think more clearly and make good nutritional choices for themselves. Tell them not to lie, to be kind and to spend a little time every day just being thankful they can still giggle in the grass. 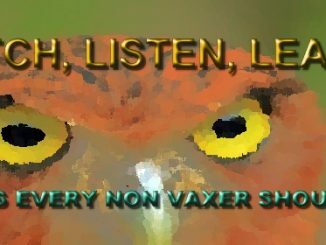 Videos That Every Non Vaxer Should See!